Item Number: 266-614 19609 Actual Weight: 0.3 lb. Ideal for use in the foodservice and packaging industry. High visibility blue bandages have detectable metal behind the non-adherent wound pad that will trigger metal detectors used by food packagers. Identifiable blue color stands out in most types of foods. Long-lasting adhesive keeps bandage securely in place. 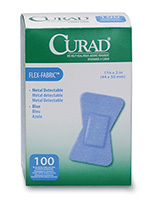 Bandage seals around all 4 sides to protect cuts and scrapes from dirt and germs.